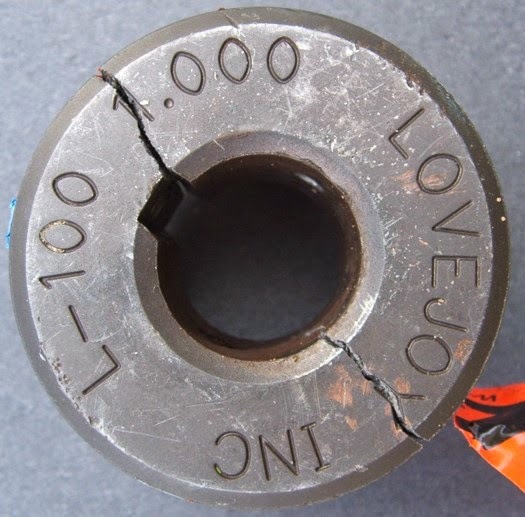 A customer recently called in to Lovejoy concerned about a jaw coupling failure. The unusual aspect of this issue was that three hubs broke in half in one week (see picture 1). Lovejoy’s technical team was baffled by this inquiry and began the process of analyzing the failures. This particular application had an electric motor (30 HP) driving a blower at 3510 RPM. Initially, our engineers focused their attention on over torque. The jaw coupling used in this application had an NBR spider rated for 792 in-lbs. of torque. The application had a torque rating of 650 in-lbs. Based on the torque specs alone, one could say that the couplings should have performed well under normal conditions (for more details on calculating torque see Coupling Sizing Torque - How to Quickly Calculate). In conjunction with the over torque troubleshooting, the end user confirmed that the alignment was within the coupling specifications. The customer used his own methods and tools to verify alignment, and he also followed the Lovejoy Install Videos and Install Guide step-by-step procedures. As our technical team continued with the troubleshooting steps, they took the time to share additional technical details as to what can cause torque spikes. One of possible causes is motor pauses and restarts. The customer then mentioned that they had an electrician replace a fuse on the motor because it had blown out previously. Furthermore, the customer mentioned that there were momentary pauses that occurred after replacing the fuse, which is an indication that the motor was causing torque spikes. Although fail-safe by design, jaw couplings can fail catastrophically when hit with a large enough over-torque. (This would be a good time to remind you that OSHA requires coupling guards for all flexible coupling applications. Please be safe.) 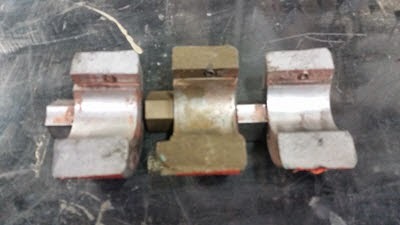 When a jaw coupling hub fails catastrophically, it will typically fail either by shearing at the jaw legs, or by breaking open between the inside bore and outside diameter of the hub (generally along the keyway - see picture 2). In this particular case and because of torque rating specs, it turned out the coupling breaking in half was actually a good thing. If the couplings were to continue to transfer torque between the motor and the blower, the probability of burning the motor or damaging the bearings in the blower becomes high. Breaking up (coupling failure) allows you to spend a few dollars to fix the problem as opposed to thousands of dollars in equipment replacement.